What started off as a personal project by Dmitry Sergeev in November 2009 in Kiev, Ukraine soon turned into one of world’s largest microstock agency; that’s what this Depositphotos review is all about. In less than 4 months by March 2009 the platform had already reached 1Million files! Then they got funded by TMT Investments in September 2011, and launched their video-selling services in August 2012, by October 2012 the platform had reached over 10million unique stock files! Depositphotos didn’t stop there, in 2013 they launched Clashot which allows users to buy and sell Mobile photos; similar to Foap. By June of the same year Depositphotos had reached its 1,000,000th buyer, and before the year ended by December the platform doubled its earlier Milestone of 10Million stock files by recording 20million stock files in collection! In exactly a year; i.e. by December 2014 the platform had crossed 30,000,000 stock files! So far it was growing by around 10million files a year; although the next 10Million files were uploaded in less than a year (just 10 months)! Fast forwarding couple years; by February 2018 the company had 80Million stock files and calculating by its previous reputation it’s safe to assume that by March 2019 (today), the platform has a minimum of 110Million+ stock files in its library! Why the story-telling? Well; in order to keep this Depositphotos review honest and transparent I believe nothing would work better than a fact-based timeline of how it has performed over the years for its users, don’t you agree? What can you Purchase on Deposit Photos? And Freebies! The platform sells Licensed Stock images, Photos, Vectors and also videos in various categories and qualities. Apart from that; it has a dedicated page for Free photos which can be accessed here- https://Depositphotos.com/free-files.html; now it may not have the most professional content (obviously cause it’s free) but sure caters to basic needs. The free library is updated every week. A site with 110+ Million stock images? That does warrant an in-depth review of its search-engine; doesn’t it? The filters, speed, precision which the platform offers letting users land on the exact photos they’re digging for is what we’ll talk about in this section of this Depositphotos review. Users get to key-in their keyword on the homepage; after which this is what’s brought up, a page containing some results and the actual search filters! I searched for “Computers” and as is evident the results did include photos of Computers, note that even without any extra filters or keywords the results displayed were pretty acceptable and consisted of variety. Just to the right of the search-box is a slide-down menu which lets users choose from Photos, Vectors and Videos. Although the top-bar auto-suggested some more keywords which would narrow down my search further such as “Working On”, “Computer screen”, “Computer Desk” and so on, this is something that may help users find more precise photos which they may not even be aware they needed in the first place. Best Match: For the closest match for your keywords. Newest: Recently added to the library. The first-filter on the column is what lets you choose from “Indoor Vs. Outdoor” photos! It’s set to “all” by default which shows the results comprising a mix of indoor and outdoor photos, but it can be isolated to either one of those! (Not offered by most other contemporaries of Depositphotos). The next filter is that for Orientation, lets you choose if you want a horizontal, vertical or square photo. The next filter is another unique superpower that Depositphotos brings to the table; it actually lets you select if there are people in your photos, and even the number of people you want in them! Taking it to another level, it even lets users select if they want “faces” or no faces! 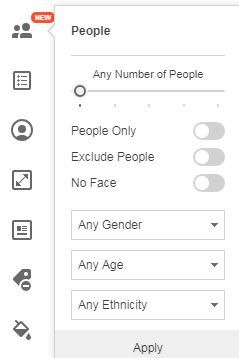 It also offers users the ability to choose the ethnicity, age and gender of the people which should appear in the searched photos! Or, you can exclude people from the photos altogether using the same filter. The next filter is that of Categories, this basically is like an additional keyword that’s paired with your primary keyword and results displayed accordingly, for e.g. Computer+nature, or Computer+Building and so on. The platform also has a filter next which lets you manually enter the name of the contributor in case you only want the content of someone specific. Then there’s the filter for image-size, there are times when we require images of specific sizes for blog posts, social media posts, ads and so on; the size doesn’t have to be entered manually; and rather can be set easily using sliders. (It’s these little details and UI-ease which make one platform better than the other). Also if you’re not well-versed with “pixels”; the filter understands inches and centimetre as well making sure you can search for what you need in the easiest possible measurements. Then you’re allowed to choose if you want “Editorial only” photos; or maybe exclude editorials? And just in case you wish to exclude certain subjects or keywords from your photos; there’s a filter for that as well. And the final filter lets you select photos comprising of or majorly drenched in specific colours! Bottomline, this in my personal opinion is one of the best search-engines that any stock-photo platform on the planet offers; well I may be wrong in which case do let me know (with reasons) in the comments. 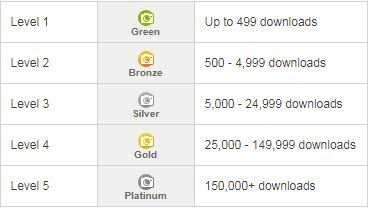 Depositphotos offers a number of different subscription plans tailored to suit each users’ needs best. The Subscription plan can be purchased either for a month; or a year. The price will differ based on this billing cycle and there’s around 20% discount in total on the yearly price as compared to the monthly package. It has a fixed number of images which can be downloaded each month for each plan. The cheapest plan lets you download a total of 75 images in a month and is priced at USD $69.00/month; or USD $699.00/year, the mid-range plan is for 150 images priced at either USD $99.00/month or USD $999.00/year. Or, for serious professionals the 750 image/month download plan costs either USD $199.00/month or USD $1999.00/year. The Flexible plan is my personal favourite; and probably the most feasible for most reading this Depositphotos review right now; that’s because it lets users download 10 high resolution images each month for USD $9.99/month. It also can be purchased for a year which would cost USD $99.00 for the year. Finally there’s the On-demand plan; it’s timed for 1-year and has two sublets which are for the Standard license, or the Extended one. The standard licence on-demand plan lets users download 10 images for USD $49.00, 25images for USD $99.00 or 100 images for USD $299.00. The extended license on the other hand costs USD $89.00 for 1 image, USD $359.00 for 5 images and USD $1599 for 25 images. Although note that they differ based on the “quality” (240p/ 480p/ 720p / 1080p). This being a Depositphotos review; I guess we can compare it to some of its top rivals and see how they price their content against Depositphotos? Shutterstock’s on-demand plan costs USD $229.00/year for 25 images (for standard license) while Depositphotos offers 25photos on its on-demand plan just for USD $99.00. Shutterstock’s normal plan costs USD $199.00/month for 750images/month; it’s exactly the same for Depositphotos as well. iStockPhoto another one of Depositphotos competitors asks for USD $206.00 (approx). for 24credits, which will get you a maximum of 24 downloads (or less, as some images are priced at more than 1 credits); again more than Depositphotos’ USD $99.00 price tag. iStockPhoto’s subscription plan costs INR 15,858/month (approx. USD $230.00) for 750downloads/month for a year; again more expensive than Depositphotos’ USD $199.00 pricing. Bottomline, as far as the pricing goes Depositphotos is arguably the cheapest stockphoto platform out there keeping in mind its quality and huge arsenal of available files. *Note that the comparison is based purely on “numbers” of downloads, the quality may or may not be the same for all the compared platforms. These being photos and videos, sizes are of prime importance, aren’t they? 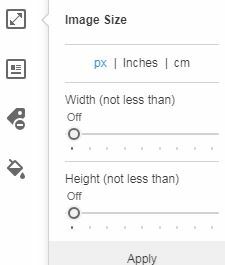 What’s best on Depositphotos and separates it from some of its rivals is that the size of the image doesn’t in anyway effect the price of the photo being purchased. Let’s say you’ve never before purchased a stock photo or licensed media online; it’s your first-day; how easy or hard will it be for you being able to purchase one such file from Depositphotos is what we’ll deal with in this section of this Depositphotos review. First make sure you have a subscription plan for your account; then find the image/video you need using the search filters provided. Once you do, simply select a size from the size-chat and click on download. That’s it! I do believe it’s one of the simplest and easiest download-interface out there, no unncesary clicks, boxes, forms needed. Find an image you like > select size > download. Note that in some cases, if you feel you purchased an image which you can’t use for some reason (there’s a specific list of selected reasons) they even allow refunds and/or reimbursements. As is probably obvious, Depositphotos is a mass-run platform; meaning any individual can start selling their work on the platform (provided certain conditions are met). Prices aren’t set by sellers and is set by Depositphotos. Let’s sum this Depositphotos review up with this final section about its support team; the company has turned into a MNC with offices in New York, Milan, Poland, Russia, Ukraine and even Cyprus. As for support they can be reached via Phone, E-mail or even live-chat. The live-chat has a response time of less than 1-minute (based on my personal experience). They also let the site be used in as many as 20 languages including but not limited to English, Français Español Русский 日本語 Česky ,中文 , Türkçe, Ελληνικά 한국어, Português, Українська and so on (I just mentioned the ones with cool fonts). I’ve even seen them reply to user questions and complaints on third-party sites such as TrustPilot which does speak for their professionalism. Cheaper than most other competitors. Plan renewal is automatic unless manually cancelled. So that’s me signing off this Depositphotos review folks. I hope every major factor or aspect that you seek an answer to has been covered in the piece? In my personal opinion, pertaining to its huge library of available content, cheaper price than its competitors and acceptable support it’s sure worth a try. Although note they did seem to have problems with their auto-renew feature; although their support team was swift in addressing the problem and they also offer refunds just in case your account auto-renews without consent. So that’s about it; do drop your two cents about this Depositphotos review as well as the platform in general in the comments.